Donna is a 30-year old single parent working at a quick service restaurant. She's been working here for months, but it won't be for much longer. At home on her kitchen counter sits a pile of unopened bills and collection letters. She's been struggling to receive consistent child support, and now she's behind on her rent. Daycare services are expensive and her credit cards are maxed out. She has trouble concentrating at work. She makes careless mistakes with orders, has a surly attitude with customers, and even considered "borrowing" some of the contents of the cash register. She calls in sick when she needs to deal with occasional financial flare-ups. Last month she borrowed from her parents and sister just to prevent her car from being repossessed. Donna wonders how long she can hold on. She spends time during her lunch break looking at job sites on her phone. Once Donna leaves or is terminated, her employer will need to interview, hire, and train a new candidate. Her money woes are about to be her boss's problem. What will it cost to replace Donna? According to studies, the cost of a lost employee vary according to their level of expertise and credentials. For positions earning less than $30,000 annually, every time a business has to replace an employee, it costs an average of 16% of that person's annual salary.1 That's $4800 for someone earning $30,000. But high employee turnover perpetuates itself. When staff members witness a revolving door, they tend to disengage, and become less productive, increasing the odds of their own departure. Customer service becomes a casualty when staff is stretched, due to the exodus of employees. For management, continually interviewing, selecting, and training the newest hires, becomes exhausting. The monotony leads to cutting corners in the selection process, resulting in bad hires and further spikes in turnover. How many Donnas work at your franchise? Surveys reveal that 33% of US workers across all industries, report feeling severe financial stress. According to PwC, 37% of these workers report that they spend over 3 hours per week at work thinking about or dealing with personal financial issues. About 30% of the Gen Y labor force, find it difficult to make their minimum payments on credit cards, while only 19% of baby boomers do. The figures for the relatively unskilled labor force found in quick service franchises are bound to be sadder still, as many teeter on a ledge of despair. What's more, 29% of money-troubled employees blame their employer for their predicament.2 "Study after study has shown that employees who are financially stressed, experience health problems more often, and are less productive," says personal finance author Gerri Detweiler. According to Reeta Wolfsohn of the Center for Financial Social Work, financial stress is the number one stressor in people's lives. The absence of a consistent and reliable work schedule for workers in businesses such as quick service restaurants, with a specific amount of income on a regular basis, increases that stress many times over. These workers need greater stability in all areas of their lives, particularly in their jobs. When that is missing, the challenge of arranging for childcare and transportation can become unmanageable and result in absenteeism, lateness, and job loss. What can a franchise employer do? The first step is to acknowledge the severity of the problem, and commit to addressing it. EAP's - Corporations with extensive benefit packages offer employee assistance programs, where staff can call for help in times of crisis. But franchises are smaller business units, where these services are not as widely offered. 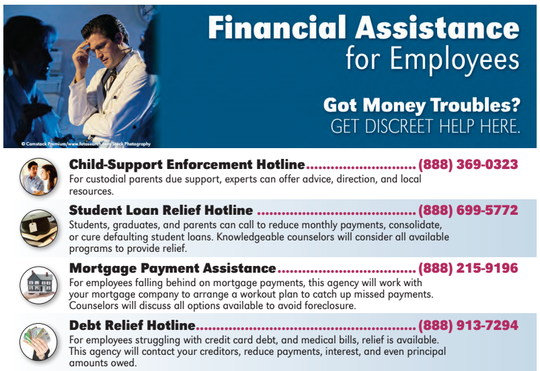 The Employee Assistance Professionals Association (EAPA) can help employers select and hire a group to provide assistance. Be sure to compare EAPs according to services provided and fees per employee. Workplace Posters - Among free resources available, CareConnect USA has published a free workplace poster, for franchise management to print and display for employees. Posters list national helplines for employees to find assistance. The helplines cover critical categories such as Child Support, Housing Assistance, Credit Counseling, Free Bankruptcy Advice and more. Calls are routed to government, non-profit, and private help centers according to region. Calls are free, and posters are available in large quantities for multi-unit owners. Mobile App - A free mobile app called "Trusted Helplines" instantly connects employees with financial and crisis resources in a vast array of categories, including mental health, depression, abuse, and addiction. This format is well suited to young workers who primarily use mobile devices to access information. Franchise managers can print the app flyer and post it in the workplace. Employees can then discreetly download the app and explore many free resources on their own time. Posting such a flyer also sends a signal that management cares about the well being of employees outside of work. Financial Education on Site - For employers willing to play a more active role, the Personal Finance Employee Education Foundation (PFEEF) can help them establish effective financial wellness programs and help employees adopt sound financial habits. Using the Personal Financial Wellness Scale™, PFEEF is able to assess the financial wellness of individuals before, during, or after the implementation of a financial wellness program to quantify the benefits of a given program. PFEEF then provides resources and services to help deliver effective instruction and training to employees. It's no secret that franchise owners face a challenge to deliver quality products and services in a competitive marketplace. But within that challenge lays the tricky task of mobilizing a distracted workforce, walking a tight rope over financial ruin with no safety net. A walk that eventually leads straight out the door.